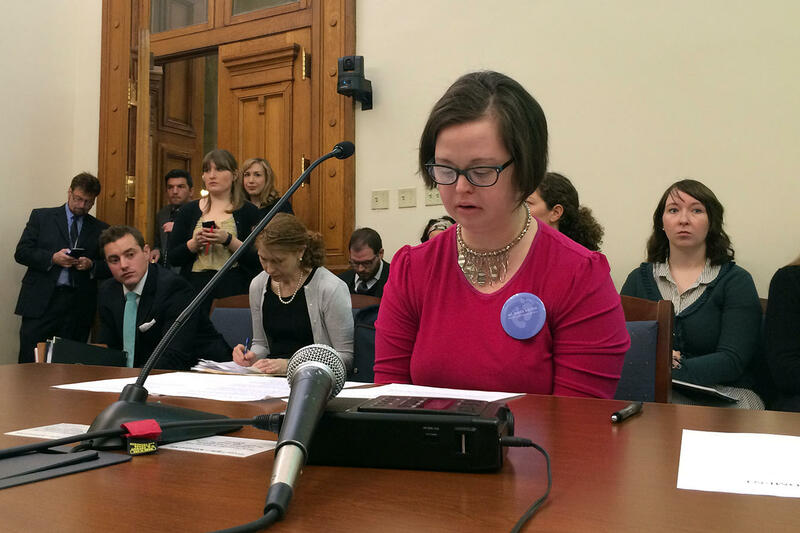 Katie Shaw, who has Down Syndrome, testified in favor of the bill Wednesday. Sen. Liz Brown (R-Fort Wayne) co-authored the bill. She says it also ensures women receive information about options outside of abortion when met with news that their child has a life-threatening disability - something she claims doesn't happen often enough. “What we have found is besides doctors pressuring women to have the abortion, they are not giving them the care and being compassionate in terms of what these women are facing," Brown says. Some who testified say the bill works to fix a system which devalues the lives of disabled children, such as those with Down Syndrome. Brown says 90-percent of the time mothers hear their child will have Down Syndrome they choose to get an abortion. Sen. Mark Stoops (D-Bloomington) says the bill breaks federal law, which allows for abortions before 20 weeks with no questions asked. And Fort Wayne Physician Kathryn Carboneau says the process of identifying motivations behind an abortion would be impractical and create privacy issues. "That's a pretty intrusive process for the state to get stepping into, when they don't know the patient and their circumstances," Carboneau says. The bill advanced out of a Senate committee by a vote of 7-4.